Fleur of England is one of my favorite brands that doesn’t get a lot of love on Sweet Nothings, simply because I usually focus on full-bust or plus size lingerie rather than lingerie for the more petite among us. Since Fleur of England has a small size range (topping out at around a US 8-10) and generally fits those with much smaller frames than mine, I’ve never been able to share a review, but I eagerly look forward to my visits to the Fleur booth at trade shows each season. Fleur, the designer and founder, is a true artist: she draws inspiration from the natural world around her, laboriously mixes colors and tests dyes until she finds exactly the right shade, and designs elaborate bespoke embroidery and lace for each season. She also single-handedly launched the sheer-tulle-and-embroidered-bralette trend, which I’ve seen copied everywhere from ASOS to Topshop to, most audaciously, For Love and Lemons, which named a blatant copycat style the “Fleur” bra, earning them a permanent black mark in my book. Each collection contains a huge range a pieces, from robes and babydolls to boudoir bras and garter belts to bodysuits and underwire bras. Best of all, lately each new release has managed to find a way to adapt major industry-wide trends while preserving the attention to detail, elegant colors, and unabashed luxury that makes Fleur of England special. There are a lot of pieces in the current collections that I absolutely adore (can someone please buy the entire Supernova collection in both colors so I can live vicariously through you? ), but the new Dare collection made me gasp out loud the first time I saw it. 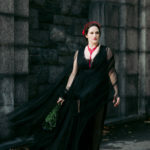 Not only do I have a serious weakness for red lingerie, and not only is it timed perfectly for Valentine’s Day, but this is the apotheosis of the invisible tulle + embroidery trend: a dazzling transparent tulle and silk long-sleeved bodysuit, designed to look like the embroidery is tattooed on the skin and cascading over the shoulders. The high neckline in front gives way to a dramatic V-back with silk-covered buttons and more sumptuous embroidery. This piece is an absolute, breathtaking showstopper, a true piece of lingerie art, and one of my favorite new pieces of the year. I also gasped when I first saw this bodysuit- I don’t think I’ll buy it though, despite how lovely it is as I’m full busted and I don’t really want to buy something that I’ll never be able to wear out of the house. I think wearing a bra underneath would totally ruin the effect.